Can you tell what these three word problems have in common? I had 8 cookies, and then I ate 5. How many cookies did I have left? I have 8 cookies. 5 are chocolate, and the rest are oatmeal raisin. How many are oatmeal raisin? There are 8 chocolate cookies and 5 sugar cookies in the cookie jar. How many more chocolate cookies are there than sugar cookies? Yes, they’re all about cookies. But these word problems have something else in common, too. These situations feel very different from each other, but you can solve them all by subtracting 5 from 8. When your child learns all three meanings, he’ll understand subtraction on a deeper level. He’ll be able to solve real-life subtraction problems with confidence, and the three meanings will even help him master the subtraction facts more easily. In this article, you’ll learn all three interpretations so that you’re equipped to teach your child this vital skill. In take-away subtraction problems, items are removed in some way. Pencils are lost, cupcakes are eaten, pennies are spent, and so forth. I had 8 cookies and then I ate 5. How many cookies are left? Thinking of subtraction as “taking away” makes subtraction easy to understand and concrete. That makes it the perfect way to introduce subtraction to young children. As they begin to explore subtraction, they can solve simple problems by physically “taking away” objects to find the answer. Starting with take-away subtraction also helps children understand that subtraction is the opposite of addition. Since removing objects is the opposite of adding objects, they can concretely see and feel the difference between these two operations. Part-whole subtraction problems don’t involve removing anything. Instead, you know the total number and the size of one part, and you subtract to find the size of the other part. Comparison subtraction is the most challenging interpretation for most children. In comparison subtraction problems, you subtract to find out how much bigger (or how much smaller) one set is compared to another. For example, we often use comparison subtraction to tell how much more one person has compared to another: How many more toy cars does Daniel have than Jacob? Comparison subtraction also arises frequently when measuring: How much shorter is this rope compared to that rope? How much older is this person than that person? There are 8 sugar cookies and 5 gingersnaps. How many more sugar cookies are there than gingersnaps? We call the answer to a subtraction problem the difference because of this comparison meaning of subtraction. When we subtract, we are literally finding out how “different” two numbers are from each other–how much greater one number is than the other. Here’s how you can help your children develop a deep understanding of all three meanings of subtraction. Include all three subtraction meanings in your teaching. Begin with simple take-away subtraction problems with your kindergartner or first-grader. Introduce part-whole problems in the later part of first grade, and finally tackle comparison problems in second grade. This clear, gradual progression will help your child make sense of all three interpretations without feeling overwhelmed. When reading subtraction problems aloud, say “minus” for the minus sign and not “take away.” For example, when you read the problem 6 – 4, say “six minus four” and not “six take away four.” This helps children think more flexibly about the role of the minus sign and mentally prepares them to understand interpretations other than take-away. Use manipulatives to act out subtraction problems. You can use commercial math manipulatives, but simple household items like buttons, blocks, or small toys work well, too. Nothing helps children understand subtraction better than physically acting out problems with real objects. When your child solves numbers-only problems (as opposed to word problems), encourage her to use whichever subtraction meaning makes the problem easiest to solve. 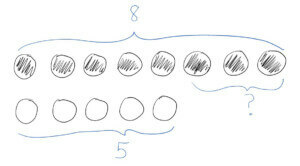 For example, take-away subtraction is best suited to problems like 12-3 which involve subtracting a small number. On the other hand, comparison subtraction is very helpful for problems like 9 -7 where the two numbers are close together. These strategies will help make mastering the math facts much more manageable for your children. Kate Snow is a mother passionate about math education. After majoring in math at Harvard, she completed an M.S. in elementary education, taught fifth grade, and wrote elementary math curricula. Now, she uses her experience to teach her own children and to empower parents to teach math with confidence at kateshomeschoolmath.com. Kate’s book Preschool Math at Home: Simple Activities to Build the Best Possible Foundation for Your Child was published in 2016 by Well-Trained Mind Press. This PDF does not download. We apologize for the broken link. We are emailing the document to you now. Very informative. One take away (pun intended) has me thinking about part to whole where you stated kids arentntaking anything away. Consider this, if there are 128 people in a team and 37 are boys, how many are girls? One would need to use subtraction to find the answer. I understand what you’re saying in the big idea and how it’s different than “take away” but you’re still taking away or subtracting the boys from the total to find the answe.